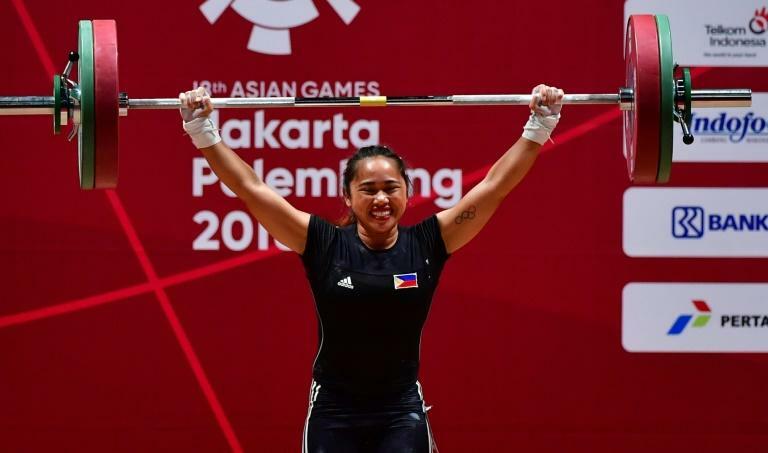 The Philippines saluted Asian Games gold medallist Hidilyn Diaz on Wednesday as the soldier-weightlifter gave the basketball-mad nation a lift after a heartbreaking hoops loss to China. Footage of the tearful Diaz, the silver medallist from the Rio Olympics, saluting the flag after Tuesday's victory brought goosebumps to Filipinos following the Indonesia event. President Rodrigo Duterte excitedly announced in a speech late Tuesday that the country had broken its gold medal duck at the games with Diaz's victory. "Congrats @diaz_hidilyn U make us feel like crying tears of joy and pride too," wrote Twitter user @yusufledesma. Vice-President Leni Robredo hailed her "story of triumph over adversity", while the lifter earned a special citation from the Air Force. "We give (Airwoman First Class) Hidilyn Diaz our snappiest salute for her discipline, perseverance and hard work that made her achieve another milestone," it said in a statement. Newspapers splashed photos of Diaz, 27, on their front pages. "Hidilyn Diaz's gold medal feat obviously eased the pain of the men's basketball team's 2-pt loss against China," @gerardmos posted on Twitter. Diaz, from a poor coastal village in the southern Philippines, began lifting weights by carting five-gallon (18 litre) jugs of water for her family to use for cooking, drinking and bathing. In 2016 she sprang a major surprise by winning the nation's first Olympic medal in 20 years, a silver. Diaz now manages her new weightlifting gym and has been seeking greater support and better training facilities for the nation's athletes. She now has her sights on the gold in the Tokyo Olympics in two years' time, which is when she also plans to retire from the sport. With her latest victory, Diaz stands to receive at least five million pesos ($93,500) in cash incentives mandated by law and from donors, legislators said.